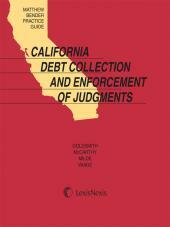 Get to the Heart of Any California Unfair Competition Issue Fast. Other features include checklists, highlighted elements for each cause of action, and extensive forms, including sample complaints. This indispensable Practice Guide is integrated with the LexisNexis Total Research System to provide easy access to relevant online resources, including public records, Matthew Bender Practice Guide series for California, Matthew Bender analytical materials, California and national news sources, and more. Matthew Bender Practice Guide: California Unfair Competition and Business Torts provides expert analysis and guidance for total research support on the topic. Bruce L. Simon is a San Francisco-based partner at Pearson Simon Soter Warshaw Penny, LLP. Prior to joining this firm, Mr. Simon was a partner at Cotchett Pitre Simon & McCarthy. He received his law degree from Hastings College of Law in 1980, and A.B. in political science from the University of California at Berkeley in 1977. He specializes in complex business litigation, including antitrust, unfair competition, securities and investment fraud, intellectual property and professional negligence. Mr. Simon is Chair of the Business Torts Section for the Association of Trial Lawyers of America, and is Chair-Elect of the California State Bar Antitrust and Unfair Competition Section. He is on the Board of Governors of the Association of Business Trial Lawyers, is a long standing member of the Consumer Attorneys of California, and he was recently appointed to the Board of Directors of the Hastings College of the Law. Simon has been lead counsel in a number of nationwide class actions in both state and federal courts including price fixing, monopolization, group boycott and unfair competition. He has also prosecuted and tried Business & Professions Code ¿17200 cases as well as having written extensively on the subject. Justice Conrad L. Rushing is currently the Presiding Justice for California¿s Sixth District Court of Appeal. He received his law degree in 1963 from the University of California at Berkeley (Boalt Hall) and spent several years in private practice before being appointed to the Santa Clara County Superior Court. Justice Rushing spent 24 years on the trial bench, serving in the capacities of Presiding Judge, Supervising Judge, and designated Complex Civil Litigation Judge for the Judicial Council Pilot Complex Litigation Project. During his tenure, Justice Rushing presided over more than 500 jury trials. Many were noted complex litigation cases involving B&P Code ¿ 17200, trade secrets, and antitrust matters. He was twice selected as Trial Judge of the Year by the Santa Clara County Trial Lawyers Association and was named one of the five best judges in the Bay Area by The Recorder. Justice Rushing has lectured widely on the subjects of B&P Code ¿ 17200, trade secrets and antitrust at the University of Santa Clara School of Law, Stanford Law School, and the University of California at Berkeley. Judge Elia Weinbach has been a Los Angeles County Superior Court Judge since November 30, 2007. He is currently assigned to the Stanley Mosk Courthouse in Los Angeles. Prior to his appointment to the bench, Judge Weinbach was a partner in Mitchell Silberberg & Knupp, LLP in Los Angeles. He has substantial trial and appellate experience in state and federal courts involving securities, intellectual property,employment, insurance, antitrust, and business contract and tort claims. Judge Weinbach obtained his law degree in 1972 from Harvard University. A former Assistant United States Attorney, Judge Weinbach was a member of Mitchell Silberberg's Governing Board and served as the firm's general counsel as well as chair of its ethics committee. He has written on the subjects of trade secrets and business torts and was formerly Co-Chair of the ABA's Section of Litigation Committee on Corporate Counsel.